A vibrant neighborhood full of character and soul, Little Havana is the first place many Cubans settled after fleeing Cuba. Come walk, learn, taste and experience the Cuban culture through the people, food and music. Little Havana hosts the largest Latino street festival in the U.S.: the annual Calle Ocho festival! It is still a predominantly immigrant community with residents from across Latin America as well as Cuba. The famous Calle Ocho (SW 8th Street) boasts art galleries, live music and dance venues, plazas and public art, and many places where you can sample cigars, Cuban coffee, and both traditional and “fusion” Latin food. Learn about the contributions of people of African descent to this neighborhood and to Cuban and Latin American history! This unique walking tour showcases sites such as: Antonio Maceo Monument, Afro-Cuban arts and culture, Sacred tree in Afro-Cuban religions, Music venue where Billie Holliday and other black jazz greats performed, Historic Tower Theater, Maximo Gomez Domino Park and Cubaocho Museum & Performing Arts Center. A delicious tasting of Cuban cuisine and beverages such as Empanada, Sugar Cane juice, Guava Pastries or Croquetas are included during the walking tour. Complimentary bottled water, sunscreen and mosquito repellant is provided. 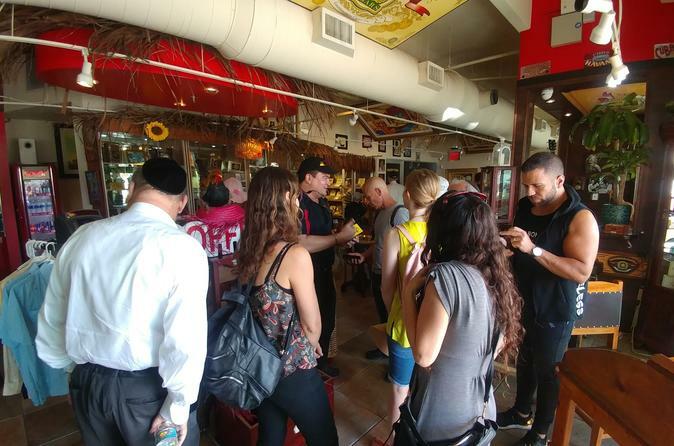 You'll meet up with your local, professionally trained tour guide at the Little Havana Welcome Center (next to McDonalds) and will become immersed in the rich culture of this Miami heritage neighborhood.